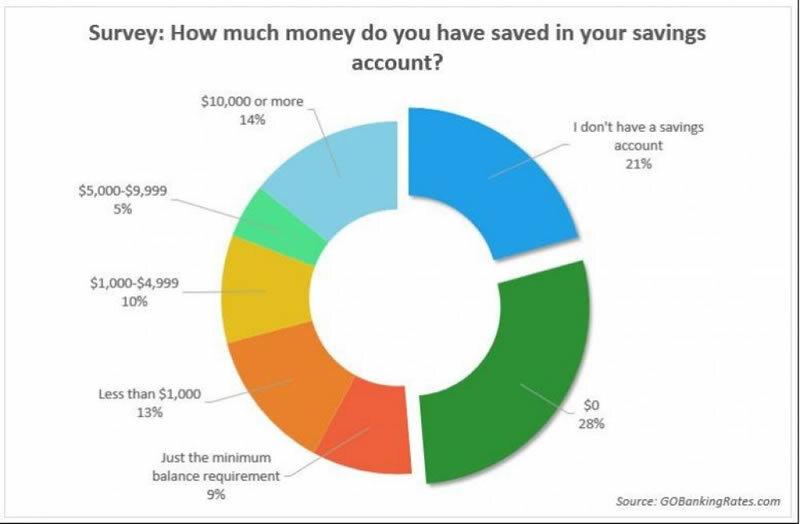 "It's worrisome that such a large percentage of Americans have so little set aside in a savings account," said Cameron Huddleston, a personal finance expert and columnist for GOBankingRates. "It suggests that they likely don't have cash reserves to cover an emergency and will have to rely on credit, friends, and family, or even their retirement accounts to cover unexpected expenses." If 62% don't have $1000 or more what will they do if someone misfortune should strike? Hope that some Good Samaritan throws money on their laps. Many Americans are having a hard time but if one examines some of the things the typical American family purchases one will note that there are many items that would fall into the category of non-essential's. Spending money you don't have on junk you don't need to impress people you don't even like is a perfect recipe for disaster. Americans have never learned to live within their means and with the economy in disarray they should be living one to two levels below their means. In general putting money into a savings account amounts to folly, as the current set up (due to ultra-low interest rates) favours speculators, but a small portion of those funds you save should put away as something to fall back. In that sense, not having $1000 to fall back on is a real tragedy. According to Credit Suisse109 million, Chinese have savings network that ranges from $50,000 to $500,000. The momentum gained traction in 2000; since that time, China's Middle Class has grown at twice the U.S rate. To avoid changes such as unemployment, Credit Suisse, measured wealth rather than income. Hence, these numbers are quite shocking; when you consider that the average worker in the U.S does not even have $5,000 in savings. Makes you wonder if we deserve the superpower designation. This economic recovery as we have stated so many times over the past few years is illusory in nature; the main driving force behind this economic recovery is hot money. The Fed has decided to try something new; maintain ultra low-interest rates for an indefinite period and in doing so force corporations and individuals to speculate. Hence the record sums of cash deployed into share buybacks over the past six years. Eventually, the US will be forced to embrace the negative rate bandwagon, and this will foster even more speculation. Translation, the Fed is not going to raise rates; in fact, they are probably getting ready to lower them. Negative rates will create a new trend in speculation, probably the likes of which we have not seen for a very long time. All those individuals who have sat on the sideline cursing this bull market, will eventually be forced to embrace it as speculation will be the only avenue left to preserve one's wealth. Hence, every strong pullback has to be viewed through a bullish lens.